The future of Carthya is an unsettled, unknown. Can it remain a kingdom at peace or will it soon be plunged into the turmoil? Rumors are spreading throughout the kingdom that the beloved royal family has been murdered. With no king, the court is divided and noblemen are gathering allies to insure their own ascendance the throne. A civil war seems imminent, unless Carthya is united. One nobleman, Conner devises such a plan. He says he wants to unify the people and save the kingdom. Four years earlier strong willed Prince Jaron had been sent to Bymar. He was to be educated there and “tamed” but pirates attacked the ship and all were lost. Prince Jaron’s body, however, was never recovered and it is this point that Conner is basing his plan upon. He seeks to find an impersonator of the lost prince of Carthya. Conner purchases four orphans to train and compete for the role. Each has his unique set of assets. Tobias is rather well educated for an orphan. He will read and rule well because of it. Roden is strong and determined. He’ll be a good swordsman and rider. Sage is defiant, independent and unpredictable. It makes him difficult to work with, but it gives him the personality traits closely associated with the lost prince. In two weeks the boys must leave their orphan selves behind and become royalty. They must learn to act like princes – in fact they must become Prince Jaron, or die. Throughout the book Sage listens, watches and tells the story as Conner’s plan is revealed. Layer upon layer of treachery and deceit unfold. Sage finds himself caught in this terrible game. He is pulled along until finally, a truth is revealed that may very well prove more dangerous than all the previous lies put together. Orphan or Prince, no life is easy, nor should it be taken for granted. 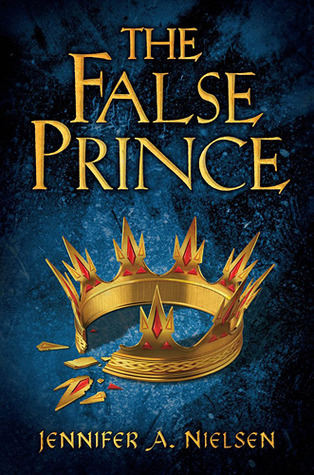 The False Prince is an extraordinarily detailed adventure filled with unanticipated dangers and actions that will have you eagerly turning the pages and awaiting the next part of the Ascendance Trilogy. Since I was never certain of what would be happening next in the first part of this trilogy, I can’t wait to discover the fates of each of the characters as their tales unfold. How will Tobias and Roden’s lives develop? Not orphans, but what exactly? What will become of Imogen? What of Princess Amarinda of Drylliad? Mott? There is so much more story to know!